On the next page select the amount of bays you would like. Shelfstore specialise in domestic & commercial shelves and shelving. In fact we have over two hundred and fifty basic shelving unit sizes. You can vary the width, depth and height to suit your personal requirements. 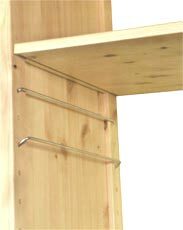 Click on the images to the right to view some of the shelving possibilities. SHELFSTORE’s versatile shelving system for the home is unique. Our component based system can be arranged into a countless combination to make the best possible use of the space available in your home. SHELFSTORE’s shelving & bookcases arrangements are ideal for the smart and elegant home. If your space is at a premium, then it makes sense to make the best possible use of it with one of our flexible shelving system arrangements. SHELFSTORE’s adaptable domestic shelving units provide and infinite combination of storage solutions for all around the house, including bedrooms, living rooms, and the home office. Our solid pine shelves are tasteful in design, timeless in durability and incredibly practical.